I have to say, I’ve been cracking away at this thing and I’m starting to see real results! Today’s installment shows an additional 3-4 hours of heavy sanding. Or if you measure time as I do, one disc of Criminal Minds from Netflix (including the episode where Morgan (played by eye candy Shemar Moore) drives an about-to-explode ambulance into a field in the middle of New York City, I die). Things at work have been really stressful lately (it’s grants proposal season for us) so taking some of my angst out on this pan has been really therapeutic. After my last installment I switched from steel wool to coarse sanding paper, which really got most of the rust out. As you can see, it’s come a far way. After I posted the first installment my dad (known around the internets as The Capt’n) emailed me a list of advice. 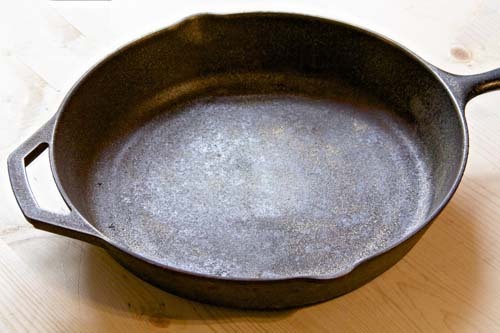 Since he’s salvaged and conditioned many a cast iron piece I was grateful for his suggestions. He sad that once I’d gotten most of the rust off that I should “burn the bejesus out of it,” so that is my next installment. In our urban backyard we combined little oil, our large burner, and some baking soda (for fire extinguishing) and smoked out the neighborhood. 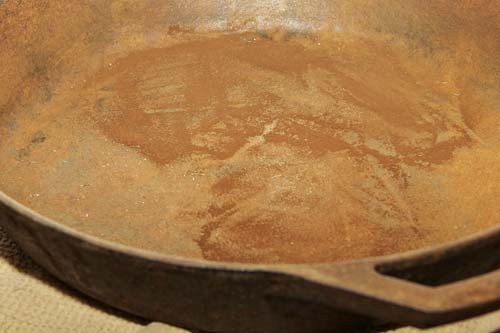 This process draws out a lot of the remaining rust, etc, and (according to the internet) restores some of the free radicals that the iron needs. If you understand why this works, I would love to know. I trust that it’s an important step but the science is a mystery to me! Anyway, those that are following along on twitter will know that yesterday we set the pan on fire and it. was. awesome. I can’t wait to share part 4. 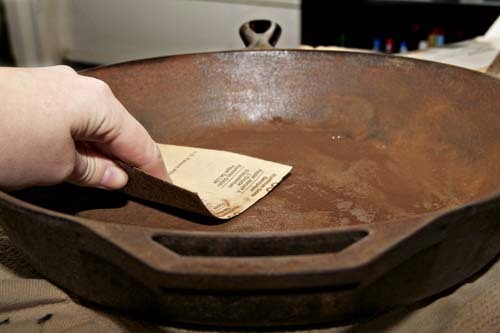 Thanks for following along, and we’ll be back with more cast iron love next week! This is so cool! I love that you are salvaging these pieces. 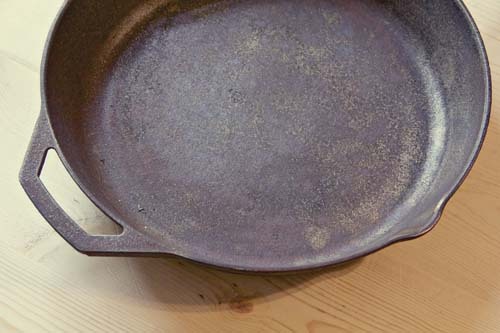 Cast iron is the best cookware! Can’t wait to see what happened when you set the pan on fire! Thanks Aimee! It was a lot of fun. WHEW!! I’m glad it was just a glitch…………I was worried that I’d lost you Kate. Great ideas and wonderful photos as always.